Beaujolais Nouveau is a red wine made from Gamay grapes produced in the Beaujolais region of France. Wine is released for sale on the third Thursday of November. “Beaujolais Nouveau Day” used to see heavy marketing, with races to get the first bottles to different markets around the globe. But not any more. The current release practice is to ship the wine ahead of the third Thursday of November, and release it to the local markets at 00.01 AM local time. In Finland Alko, monopoly company selling wines and alcohol, starts selling these wines at 09.00 on Thursday 17th November, 2016. 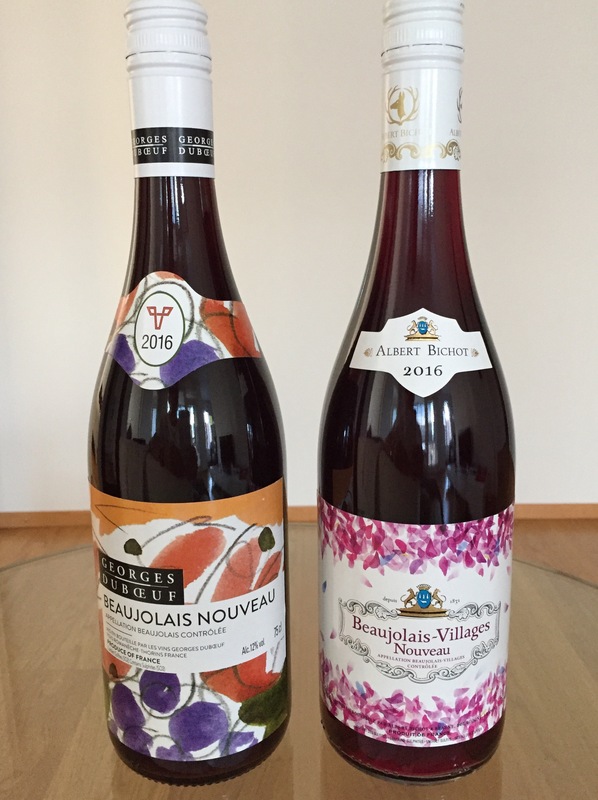 This year wines available from Alko were Albert Bichot Beaujolais-Villages Nouveau and Georges Duboeuf Beaujolais Nouveau. Label of last year’s wine from Georges Duboeuf was much more colorful. Maybe it is time to slow down a bit? Did it scare consumers? Both wines are almost violet, blue-reddish like young wines always are. The color in the first picture is a little too dark than wine is in natural. 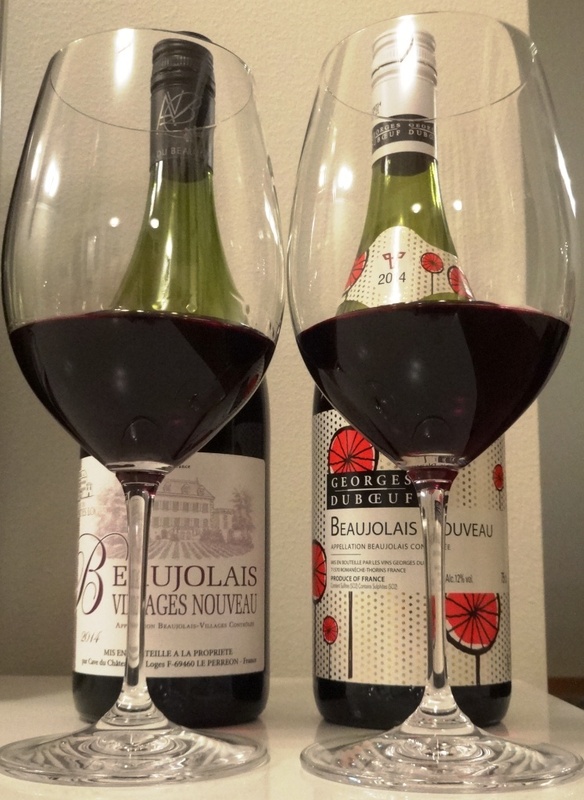 It seems that Georges Duboeuf Beaujolais Nouveau has more deep bouquet. Young, light fruity wines. Berries dominate, but on the other hand taste is skinny. Aroma is better than taste, but with unspiced food and pizzas, both wines pair well. Beaujolais Nouveau is a red wine made from Gamay grapes produced in the Beaujolais region of France. Wine is released for sale on the third Thursday of November. “Beaujolais Nouveau Day” used to see heavy marketing, with races to get the first bottles to different markets around the globe. The current release practice is to ship the wine ahead of the third Thursday of November, and release it to the local markets at 00.01 AM local time. In Finland Alko, monopoly company selling wines and alcohol, starts selling these wines at 09.00 on Thursday 19th November. Luckily 2015 we are able to taste 2 different wines, both cost to consumers less than 10€ in Alko. 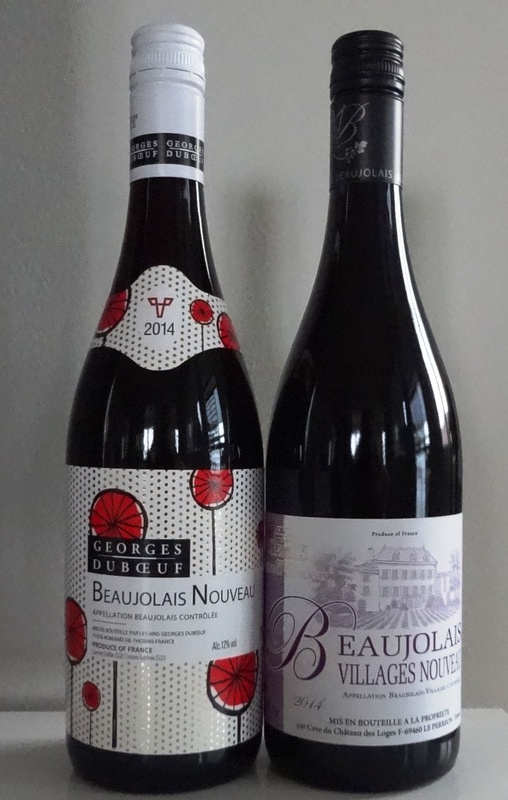 These wines are Doudet-Naudin Beaujolais-Villages Nouveau and Georges Duboeuf Beaujolais Nouveau. Georges Duboeuf wine was for also for sale last year, but Doudet-Naudin is new. One specific feature differentiates these wines from the previous vintages, amount of alcohol >13%!!! Bottle: Label of Georges Duboeuf follows colorful and joyful trend but Doudet-Naudin does not look traditional Beaujolais Nouveau style with black background. Wine: Both wines are almost violet, blue-reddish as young wines always are. Fruity, even sweet aroma especially when using tasting glass. Cherry, rasberry and fruit candy scent came in to the nose from both wines. It seems that Doudet-Naidin has more deep bouquet. Medium-bodied, young, light fruity wines. Berries (cherry, cranberry) dominate, but on the other hand taste is light. Aroma is more convenient than taste, but with unspiced food and pizzas, both wines pair well. Doudet-Naudin felt softer because less acidity, but extra 0,5% in strongness made this wine my favourite. Alko has imported 50.000 bottles alltogether of these wines. Let’s see is they are finished before Christmas. The current release practice is to ship the wine ahead of the third Thursday of November, and release it to the local markets at 00.01 AM local time. In Finland Alko, monopoly company selling wines and alcohol, starts selling these wines at 09.00 on Thursday 20th November. Luckily 2014 we are able to taste 2 different wines, both cost to consumers less than 10€. 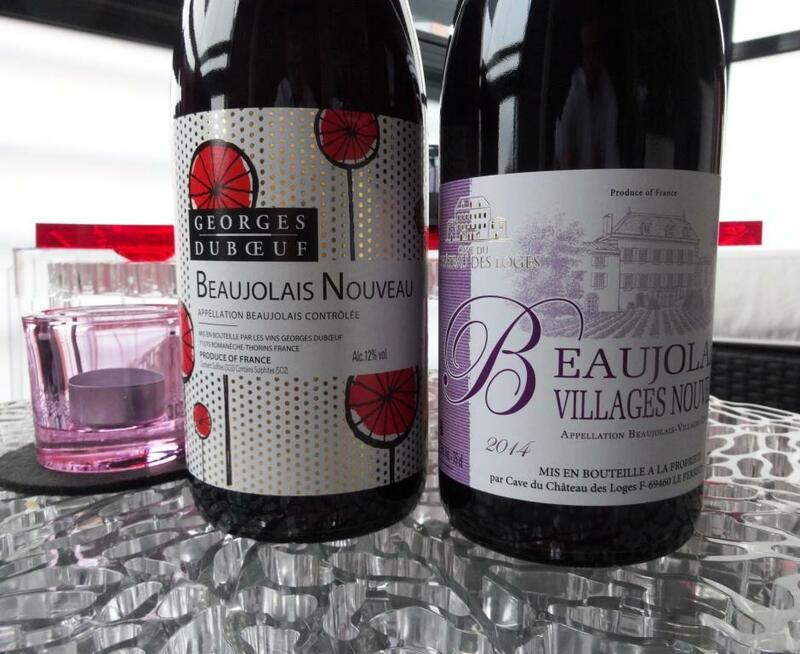 These wines are Château des Loges Beaujolais Villages Nouveau and Georges Duboeuf Beaujolais Nouveau. 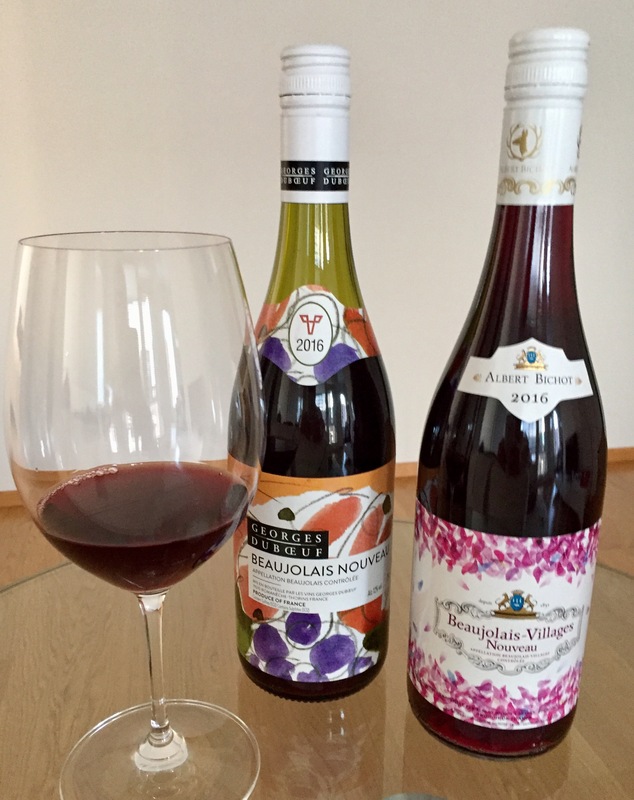 Do not know exactly what has happened, but 2014 Beaujolais Nouveau wines taste better than 2013 wine. Maybe better vintage? Any other opinions?